The government has conferred the Ashok Chakra, India's highest peacetime gallantry award, which is the equivalent of the Param Vir Chakra, on a 21-year-old army commando who died participating in Operation Sarp Vinash in Jammu and Kashmir this year. Sanjog Chhetri of the prestigious 9 Para Commando was part of a team tasked for the initial operations on terrorist locations in Surankot area of Rajouri sector on April 22. 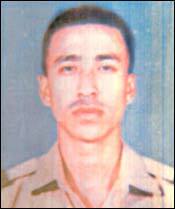 "Paratrooper Sanjog Chhetri, in one last act of supreme valour, drew his commando knife and charged into the hideout, killing one more terrorist in hand-to-hand combat before finally succumbing to his wounds." Inspired by his supreme sacrifice, his comrades killed 13 terrorists that night and captured a Pakistan-trained terrorist. Chhetri was born on the Republic Day (January 26) of 1982 in Sikkim. A resident of South Sikkim district's Namchi tehsil, he lost his father when he was very young and he and his sister Sangeeta were adopted by their father's elder brother. He joined the army in March 2001 and was later selected to the exclusive 9 Para (Special Forces), which has been constantly in action in J&K since the beginning of militancy there in the late 80s. The unit has also seen action in Sri Lanka as part of the Indian Peace Keeping Force in the late 80s. The elite unit has so far won an unprecedented three Ashok Chakras. Captain A S Jasrotia posthumously won the Ashoka Chakra in 1996 and Major Sudhir Kumar in 2000 when he took on a big group of terrorists in Rajawar jungles in Kupwara district of J&K. The 9 Para is the only battalion to have won the army chief's unit citation three times. It was also labelled the 'Bravest of the Brave' for its valiant efforts to retake the entire Zulu ridge in Mushko valley during Kargil operations. The 9 Para is one of the four special forces in the army and is specially tasked for mountain operations. The unit traditionally operates between Akhnoor and Poonch areas in J&K. It was this unit that held the Munawar Tawi Line against a Pakistani armoured thrust in Chamb sector in 1971, for the first time donning the role of a regular frontline unit to stem the Pakistani attack. This year the unit has won one Shaurya Chakra and 10 Sena medals. It is my high previlage to saluate to all time greatest hero.God blessing with all your family members.